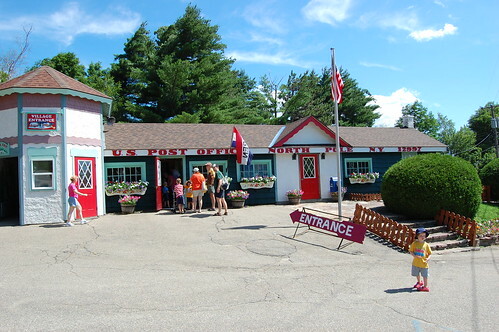 Last year when we were planning our trip to Bar Harbor, we toyed with places to visit on the way there. Knowing we’d cut across the top of New York State, some of the suggestions we got included the Ausable Chasm or the Lake Champlain Ferry (which we took). Both Marla and Nancy suggested — no, raved about — Santa’s Workshop in North Pole, New York. Nancy and Marla both – could there be a higher endorsement? And they were so very, very right. Who knew? There really is a North Pole, New York. See? 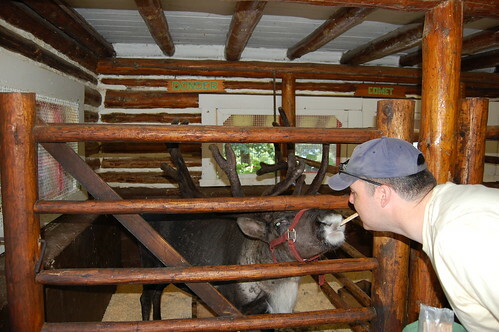 But I have to say, we had the most fun with Santa’s reindeer. You know I have a thing about reindeer names, right? Well, we were all tickled to see that the Santa’s Workshop people got it right. 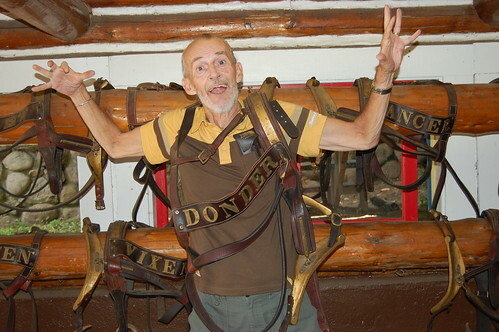 Not content to simply admire the bridle on the wall like I did, Papa Lou got into the act. Erm, into the bridle, actually. 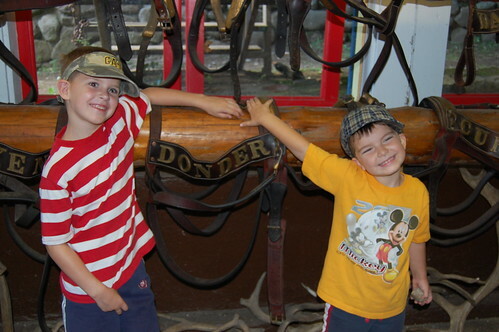 And here’s another one of my brother bonding with Donder himself. *shrugs* It’s a family thing. So if you ever find yourself in the neighbourhood of Lake Placid, looking to entertain the wee ones, I can’t say enough nice things about Santa’s Workshop. It made the drive home a perfectly lovely counterpoint to the hellish drive down! That was an adventure and a half. WOW. Your drive there it the stuff out of nightmares. Glad that thing gradually got better. Is the North Pole worth driving there and back in one day? Hmm, there and back in a day would make it a minimum of four hours of driving each way, which would be eight hours of driving plus park time. I wouldn’t do it, but then I’m a little shy of car travel all of a sudden!! I would, however, drive down and sleep overnight and come back the next day. I think there was a little campground nearby, too… that would be ideal! 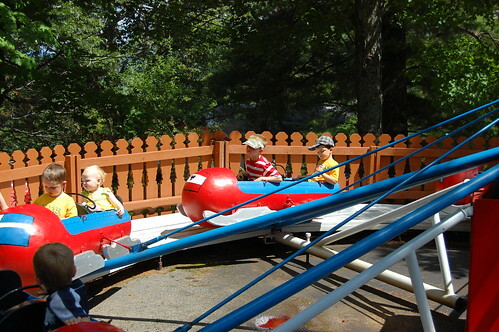 Have you been to Storyland near Renfrew? This park reminded me a lot of that — similar in size, but a little more polished and with rides instead of just climbers and slides and swings and such. 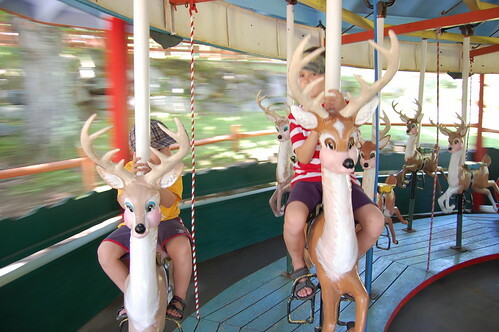 Another trip I’d consider is Santa’s Workshop on one day, overnight somewhere in the area, and then Water Safari (http://www.watersafari.com/) on the way home. I love water parks!! You know that village has been there a long time. My Mom went there BEFORE she got married with friends when she used to take the train to NYC to shop. And that must have 50 years ago. They have been married 47 this year. Some things stay around forever! Glad to see you Dad in his name tag. LMAO! LOVE the reindeer nameplate!!! Love it!! Glad you enjoyed it, have yet to bring my boys to that particular Santa’s Village. Hi this is very good site. I really like it. Thank you for this blog………..
Postcards from the Mothership » Best Santa-social media mash-up EVER!